Do you want to have a prosperous online business? Then speed up your website! Your online resource may be well-optimized, but it won’t score 100/100 if it needs quite a lot of time for downloading. The truth is that quick web sites are always more popular than slow web sites. This happens due to the fact that Internet users are very impatient nowadays. They want to get the best from the best immediately. So why don’t you supply your web site with the best web performance! In order to pump up your web site, you have to analyze your web performance indicators very carefully before doing any changes. Actually, you have to find out what slows down your web site and then get rid of it. 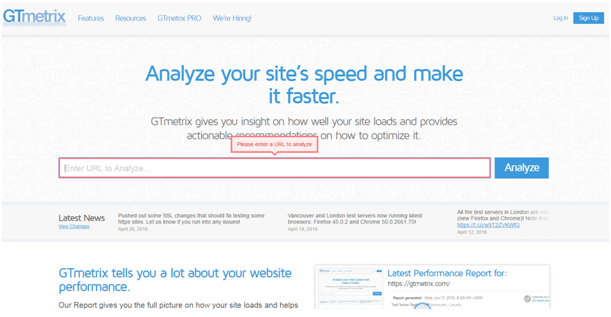 GTMetrix is a very handy tool for web performance analyzing. It’s free of charge. You can either use GTMetrix plug-in or its online version on GTMetrix official web site. Once you have decided to use the online version, you can either create an account on it or test your web page without any procedure of registration. GTmetrix will analyze your web resource according to your browser’s performance, its location, download speed, HTTP requests and the whole ‘weight’ of the web page. PageSpeed and YSlow indicate several quite different views on your web site’s structure and mechanisms that influence on its performance. You will get a simple chart where the main web site’s speed problems are evaluated from A to F. ‘A’ means that this problem isn’t yours. ‘F’ highlights the things that slow down your web site and you have to do something with them if you want to get better performance. In addition, the program gives links to useful information resources where you can read and find a decision how to get rid of your problem. Waterfall option is really a thing that can help you understand what is wrong with your web site and how to speed it up. It provides detailed information about your DNS lookups and time needed for connecting, blocking, sending, waiting and receiving. For instance, the time of the first TTFB byte’s download is a very important indicator of your server’s performance. If it is constantly high after all your adjustments it means that your web performance problem may be in the server you are using at the moment. Make several tests a day during a week. Your website’s speed can change during the day due to the number of your site’s visitors and total server’s load. Choose the most appropriate point for your testing. If you are developing a local project, then you should choose the server which is not far from your home place. In case it’s a global project then use at least four or five points (for example, the US, Europe, Australia, Asia) to test. In order to choose necessary servers, you should register on GTMetrix official web site and create an account there. Don’t limit only with your home page test. Home pages aren’t usually overloaded with information that’s why they seem rather quick. In order to get a general view of your web site’s performance test several pages from it. You should try to squeeze everything you have on your web site: HTML, CSS, JS. For example, get rid of useless tags in HTML. Use special compressors to minify CSS and JS. Work with your images. They may have several excess bites that can be optimized. You can do it manually with the help of special applications or install libraries on your server that will handle this. Reduce the Amounts of Requests. Try to combine CSS and place them in the footer. Once you have used earlier JS files which aren’t too big you can inline them. Don’t forget that you can also reduce the number of requests by using lazy loading images! You don’t need to change anything and still save bandwidth by gzipping files before they are served. It’s not hard to do and takes short time to implement. If you want to have a nice Google rating, make your site really snappy. Think of your browser and client side caching. Setting files will never (or close to never) expire so you can give proper hearders and save more bandwidth. CDN is a number of servers placed in different places around the world which may store your JS, CSS, images and other files. They help to save your traffic with the help of caching, rise your downloading speed, support libraries in a current state and eliminate all cookies. For instance, you can try your hand with affordable cdn service. It helps to accelerate content and business at a low price. 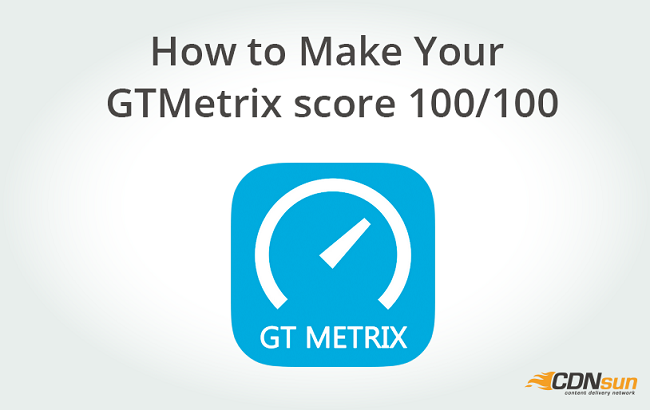 Today we have given you some useful tips and advice how to make your GTMetrix score 100/100. Try them and enjoy your web site’s speed.